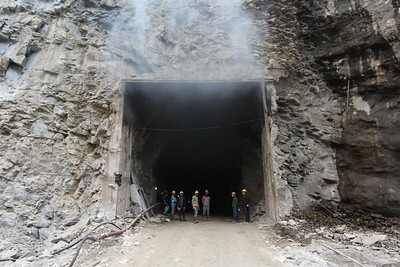 Powerhouse construction in the main tunnel of the 456 Upper Tamakoshi Hydropower Project. 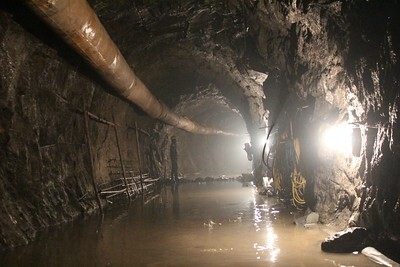 1.4km underground, near Gonggar, Dolakha. 2013. 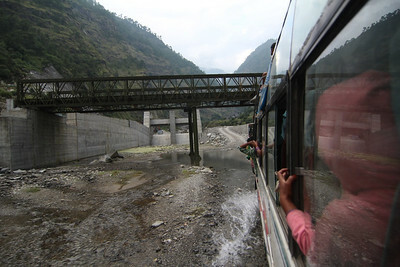 Bus travelling beneath the headworks consruction of the 90MW Trishuli 3A Hydropower Project (Chinese), upstream towards Mailung, site of the 216MW Upper Trishuli 1 Hydropower Project (Korean). 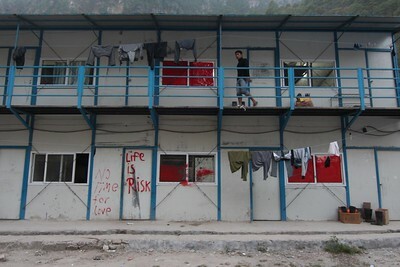 Salleta, Rasuwa. 2013. 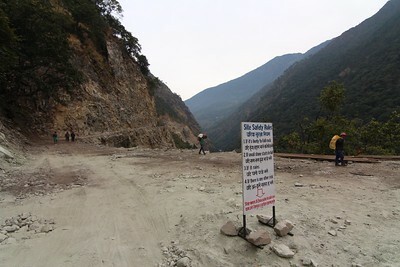 The road leading to Lamabagar, site of the 456 MW Upper Tamakoshi Hydropower Project. Simigaun, Dolakha. 2013. 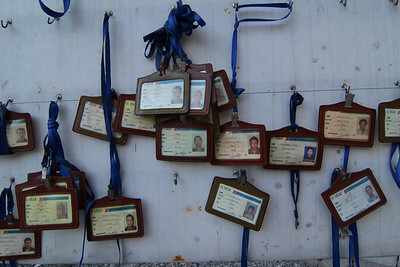 Worker identification cards hanging at the entrance to the powerhouse tunnel for the Upper Tamakoshi Hydropower Project - work on the tunnel system proceeds 24 hours per day, with over 400 laborers and engineers. Gonggar, Dolakha. 2013. 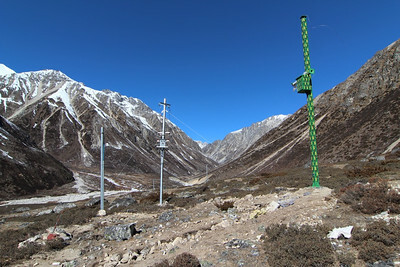 The terminus of the electricity lines coming from China at the border on Nepal and the Tibetan Autonomous Region. 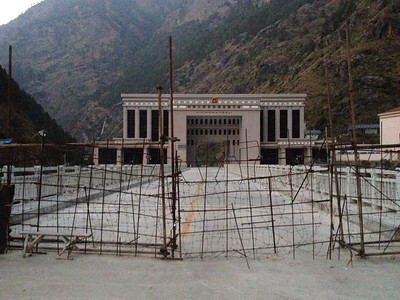 The border is currently a three day walk from the roadhead in Lamabagar, but future hydropower projects and roadbuilding will facilitate an overland road to Tibet here. Lapche, Dolakha. 2013. 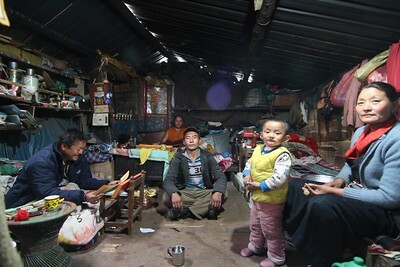 Staying in the home of Bhujung Sherpa, in Lumnang, lower seasonal settlement for the 13 Tibetan speaking families who live in Lapche. The Lapche region of Lamabagar VDC is currently roadless, but there are two hydropower projects that will affect these communities. 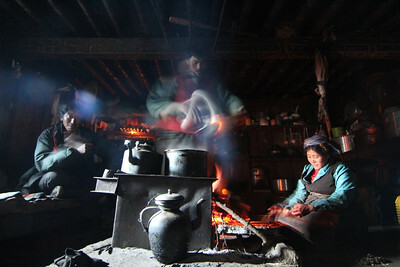 Lumnang, Dolakha. 2013. 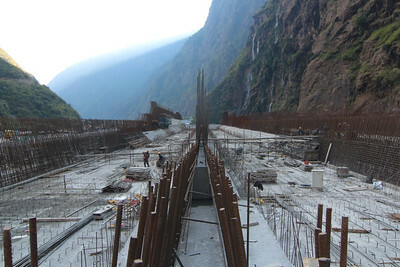 Construction of the dual desanding basins above the intake for the 456 Upper Tamakoshi Hydropower Project. 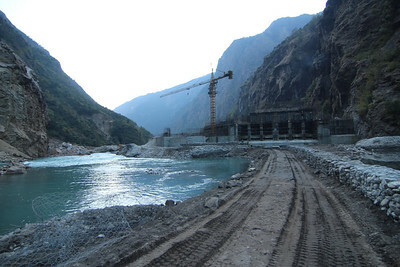 Construction is being done by SinoHydro, a major Chinese development contractor for UTKHP Limited and the Nepal Electricity Authority (Government of Nepal) - the largest hydropower project currently being built in Nepal. Lamabagar, Dolakha. 2013. 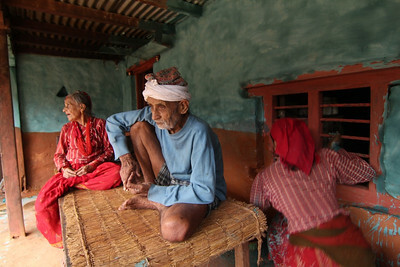 An older man reflecting on past work as a laborer for the nearby 22MW Trishuli Hydropower Station, which was completed in 1968 and was the largest in Nepal at the time. Hundreds of local workers were paid 2-3 Nepali rupees per day to assist with canal and bridge construction, and many local natural resources were dedicated to the project. Archale, Nuwakot. 2013. 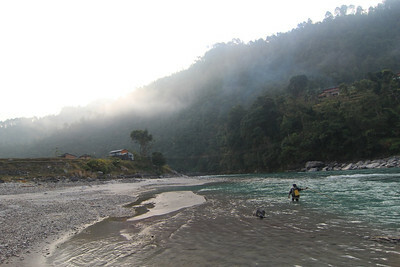 Man fishing in the Tamakoshi River in the 'inundated area' of the pending 650MW Tamakoshi III Hydropower Project. 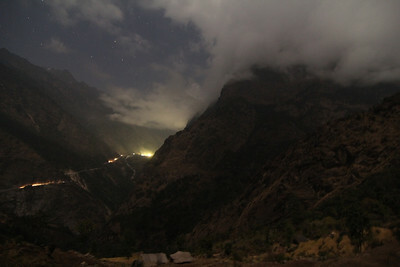 Nag Dahal, Dolakha. 2013. 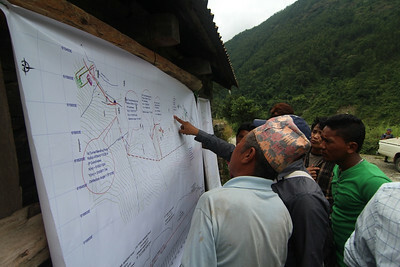 Local men perusing plans for the Trishuli 3B Hydropower Project at the September 2013 Public Hearing. The meeting was later obstructed by a local boycott of the EIA process. 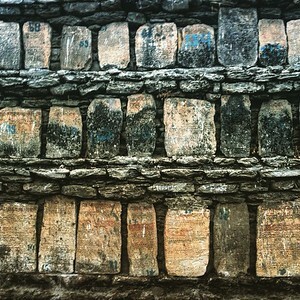 Pahirebesi, Nuwakot. 2013. 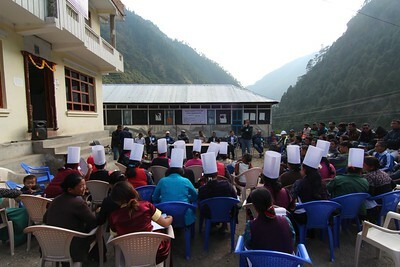 People from the 'project-affected areas' attending the public hearing for the 37MW Trishuli 3B Hydropower Project, held by the Nepal Electricity Authority. The meeting was later boycotted by locals seeking greater recognition of their concerns. Pahirebesi, Nuwakot. 2013. 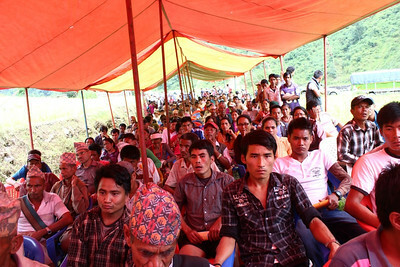 Local man, security forces, and a young engineer at the contested public hearing for the Trishuli 3B Hydropower Project. Pahirebesi, Nuwakot. 2013. A lama from Chora Gepheling Monastery walking along the Lapche Khola, headwaters of the Tamakoshi River, near the edge of Tibet. In the coming years a 220MW project is being proposed just downstream from here. Lapche, Dolakha. 2013. 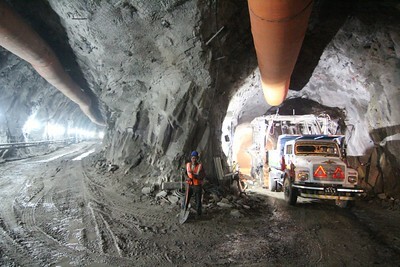 Headworks construction of the 456MW Upper Tamakoshi Hydropower Project. 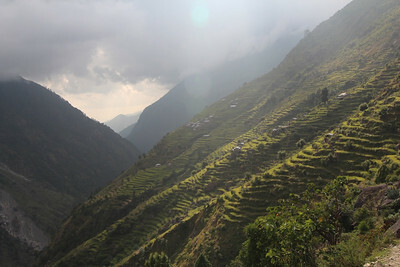 Lamabagar, Dolakha. 2013.